So many natural cave in Indonesia to explore. One of them is Cave Jatijajar - Indonesia. 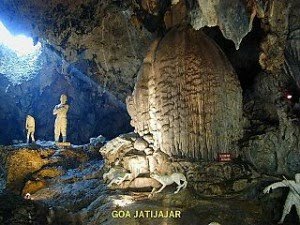 Jatijajar Cave is a natural cave that was originally formed from limestone. The cave was first discovered by a farmer named Jayamenawi in 1802. The story, while it is taking the grass of the field, he plunged into a hole. Some residents tried to help by cleaning the ground Jayamenawi manhole cover. They were discovered that the hole leads into the cave. It is estimated that the hole was a cave ventilation holes. Length overall Jatijajar cave from the entrance to the exit to reach 250 meters. While the cave reaches 12 meters high, 15 meters in width, and thickness of the ceiling of 10 meters. When measured from sea level, high-Cave Jatijajar can reach 50 meters. Jatijajar Cave was built and developed as a tourist attraction in 1975. Initiators are Suparjo Rustam, when he was still the Governor of Central Java. Which act as the executor of the construction project is a CV Jatijajar cave. AIS from Yogyakarta, led by Mr. Saptoto, an artist who is quite famous deodrama in the homeland. After Cave Jatijajar awakened, tourism management is done by the Local Government Dati II Kebumen. In front of the Cave Jatijajar attractions, there is a statue of a dinosaur as an important symbol of this cave. Visitors who enter the cave will automatically pass through the mouth of this dinosaur statue. This statue looks out of water, as the estuary of the springs that exist in the cave, which was from Spring (River) kantil and Spring Rose. The water is believed to not be exhausted, even in dry weather conditions though. Water is used by people around Cave Jatijajar as irrigating their fields. While further down the hall into another cave, the visitor will see there are many such beautiful scenery. The room in the cave is illuminated by many lights, starting from the entrance up to the outside, so visitors need not worry with the lighting conditions over there. On the cave ceiling is a hole for ventilation of the cave. In the middle of the circular room there are chairs that can be used as seats visitors who want a break, while looking around the room in the cave. Visitors can see a lot of ornament stalactite, stalagmites, and pillar of chalk (as a meeting between stalactite and stalagmite). There, visitors can also see eight deodrama mounted, plus the existence of the statues which amounted to 32 pieces. The sculptures that tell the story of Raden Kamandaka, later known as Legend Kasarung monkey. That said, the cave was once a place of hermitage Raden Kamandaka, King Pajajaran crown prince, to get wangsit. Why Raden Kamandaka to be imprisoned in this area? Because when it is, Kebumen into the territory of the Kingdom of Padjadjaran in the central capital city of Bogor (Batutulis), now in West Java. Visualization of the legend can be seen in diodrama that is in the cave. Visitors can then continue the journey in a way down the stairs that are part of the tail dinosaur statue. In the basement there are some underground river (spring), which is still active. Rivers was one of privilege Jatijajar cave. Noted there are four spring (according to other sources there are seven spring, but the data could be obtained only four only), the Spring Roses, Spring kantil, Jombor Spring, and Spring Puser Earth. The flow of water in Spring Rose through the narrow hole that penetrates through the outer cave. So it is with Spring water flow kantil. It is said that if visitors can approach and wash face with water in the Spring Roses, then he will stay young. There is also a belief that if someone is washing your face or shower with water Medium kantil, the intentions or ideals would be quickly granted. Meanwhile, by the manager of tourism Jatijajar Cave, Spring and Spring Puser Jombor deliberately sacred Earth. If you want down the hallway through two spring cave, visitors must obtain permission from the manager is very strict. The cave is located in the Village Jatijajar Jatijajar, District Daddy, Kebumen, Central Java Province, Indonesia. This cave is located 21 km southwest of Gombong District. To reach these attractions, visitors do not need to be confused. Therefore, its location can be easily achieved. Visitors can use a private car or public transport. If you want to use public transport, visitors need to ride public buses Gombong-Jatijajar majoring in Terminal Gombong. In the area attractions Jatijajar cave contained a number of lodging (hotels and homestay) and a restaurant or a restaurant with affordable price. There also are a number of stalls selling souvenirs typical Kebumen, especially food Lanthing. In Jatijajar cave complex there is a park that can be used as a family playground and park. This park called Monkey Island because there is so much monkeys.